Plastic water bottles are everywhere. These containers may be convenient, but they’re piling up in landfills. The organization Ban The Bottle estimates that just under 19 billion plastic bottles are thrown away each year in the US alone. Some plastic bottles are recyclable, but most of the ones produced do not end up being recycled — they end up in the trash or littering our oceans. Around the world, innovative thinkers have been trying to come up with various ways to deal with our plastic problem. Researchers at Harvard University have engineered a bioplastic from shrimp and krill shells. A research team at the Italian Institute of Technology has developed a bioplastic from food scraps. These are both exciting solutions, should these technologies take off and become used on a large scale. As far as existing bottles, Ecotec Environmental Solutions, a firm based in Germany, has actually been building houses in Africa and Latin America using plastic bottles. This is a wonderful idea that takes care of a good chunk of the bottles already polluting our planet. Now, an Icelandic student has come up with a great way to house water without using plastic at all: by harnessing the natural properties of algae. Ari Jónsson is a product design student at the Icelandic Academy of the Arts. This past March, he attended the Iceland Design Center’s DesignMarch in Reykjavik, where he revealed his algae-based biodegradable water bottle at the Drifting Cycles student exhibition. This ingenious bottle begins to decompose as soon as it’s empty. To create his water bottle, Jónsson started with agar powder, derived from red algae. He added water to the powder to form a jelly-like substance. He then poured the mixture, after he achieved the correct consistency, into a pre-frozen water bottle mold. After cooling, the water bottle was complete. The agar material of the bottle is 100 percent natural — and even edible. Thanks to its natural properties, it also stays cool in hot weather. Also, the material itself is reusable, so if mistakes are made during bottle production, it’s not wasted. Jónsson’s bottle is still in concept design stages and needs some improvements before it can become a practical and marketable alternative to plastic water bottles. First of all, there’s the issue of testing how (and how long) the bottle will keep on store shelves. Second, the material in its current form rips rather easily. Additionally, to properly dispose of the bottle, one would need to start a compost heap, since even food items take a long time to decompose in a landfill setting. We salute this bright young inventor and hope that the algae-based water bottle project goes forward and a version of this bottle hits the market in the near future! Tanya is a writer at The Alternative Daily with a passion for meditation, music, poetry, and overall creative and active living. She has a special interest in exploring traditional Eastern remedies and superfoods from around the globe, and enjoys spending time immersed in nature. Previous articleSpace Archeology Is A Thing — Really! 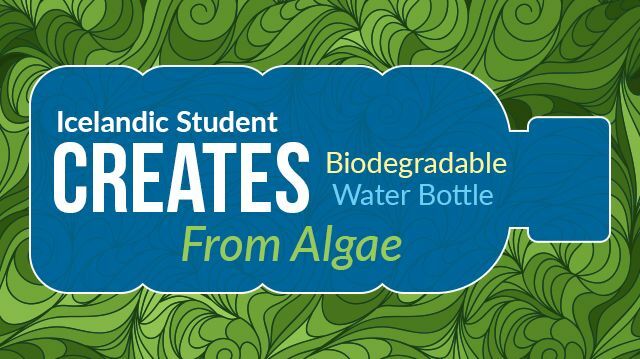 Hey Buddy!, I found this information for you: "Icelandic Student Creates Biodegradable Water Bottle From Algae". Here is the website link: https://www.thealternativedaily.com/student-creates-biodegradable-water-bottle/. Thank you.